Found in South Africa: Key Link in Human Evolution? A nearly complete fossilized skull of a 11-to-13-year-old boy from a new species of early Australopithecus hominid discovered in the Cradle of Humankind, outside Johannesburg. The skull is approximately 1.9 million years old. Evolution skeptics like to trot out the argument that if Darwin had been right, scientists would have discovered transitional fossils by now  creatures with a mix of features from earlier and later species. Since they haven't, the deniers say, evolution must not be true. The truth is that paleontologists have found transitional species by the score, from many different time periods. But none have materialized from as crucial a point in our evolutionary past as a pair of skeletons whose discovery was announced today by the journal Science. 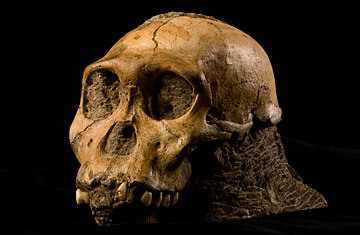 The fossils, which have been determined to be of a new species, Australopithecus sediba, were found by Matthew Berger, the 9-year-old son of paleontologist Lee Berger, of South Africa's University of the Witwatersrand. (The elder Berger tried in vain to get the editors of Science to list Matthew as a co-author of the paper.) The bones belong to a preteenage boy and a woman estimated to have been in her late 20s or early 30s; the individuals died at about the same time, and before their remains had fully decomposed, they were entombed in an avalanche of sediment and were nearly perfectly preserved deep in the Malapa cave north of Johannesburg. The Au. sediba bones are important for their vintage  they date back to the moment about 2 million years ago when the genus of human ancestors known as Australopithecus was just giving way to a new group called Homo, which would eventually produce Homo sapiens, or modern humans. But the new find is perhaps most astonishing for its state of preservation. "These are arguably the most complete hominid skeletons ever discovered," says Berger. In the field of human origins, that's huge: many human ancestors have been identified based on only a few bone fragments, and even Berger's rivals in the intensely competitive field of human paleontology were quick to praise his discovery. "This is an outstanding find, and Lee should really be congratulated," says Meave Leakey, a paleontologist with the National Museums of Kenya and a member of the world's most celebrated fossil-hunting family. Other paleontologists have confirmed the dating of the skeletons to somewhere between 1.95 million and 1.78 million years ago, which is another crucial clue to figuring out the new species' place in our evolutionary story. That's where things get a lot more contentious. The skeletons show a remarkable mix of primitive and advanced features. The arms, for example, are relatively long and apelike, suggesting Au. sediba was a prodigious tree climber. The hands are apelike in their curvature but surprisingly compact, like a more modern hominid's. And the longer legs and shortened pelvis are decidedly modern. "They were competent bipeds on the ground," says Berger. The boy's skull is a similar mashup of older and newer features. (The woman's skull is missing.) It is quite small  "like a pinhead on top of the body," said Berger at a teleconference on Wednesday, April 7  and would have held a brain hardly bigger than that of Australopithecus afarensis, the 3.2 millionyear-old species whose best-known example is the celebrated Lucy. But many of the boy's facial features  a prominent nose, relatively small molars and less pronounced cheekbones  look more like those of later Homo species. As to exactly where Au. sediba fits in human evolution, Berger offers two possibilities: First, it could represent some sort of evolutionary dead end, a species that came and went and had nothing directly to do with modern humans. "It's like we're seeing some experiment going on," he says. Or  and this is the idea he favors  it could be the direct ancestor of Homo erectus, which most paleontologists agree is the direct ancestor of Homo sapiens. Indeed, Berger's colleagues had initially planned to assign the new species to Homo but changed their minds, given the specimens' long arms and the boy's small brain. "This may be a Rosetta stone for defining what the genus Homo really is," says Berger. It is at this point that Berger's claims start to meet a lot of resistance. Leakey, for one, thinks the new species is at best an evolutionary cousin of our ancestors and not a direct ancestor of the species that eventually gave rise to Homo sapiens. Tim White, a paleontologist at the University of California, Berkeley, whose team recently discovered a 4.4 millionyear-old skeleton of Ardipithecus ramidus, also believes Au. sediba bears no relationship to modern humans. White points out that drawing strong conclusions about a species based on such a young individual as the fossilized boy is risky, because the skeleton would have still been developing. "The obsession with Homo in their [paper's] title and text is difficult to understand outside of a media context," White says, referring to the Science study that describes the new species as "Homo-like." But other paleontologists are inclined to agree with Berger. William Kimbel of Arizona State University's Institute of Human Origins says Berger's paper makes the case that the specimens show early evidence of Homo. More important, Kimbel says, the fossils reveal the pace of change in early human ancestors. "What it tells us about the early stage of the Homo lineage is, for example, that there were already substantial changes in the face, the teeth and the pelvis, while the brain size and limb proportions were still reasonably limited," he says. "Having that calendar of change allows us to pose questions about what forces were driving that calendar." More questions  and answers  will likely arise as Berger and his team continue studying the South African site. They are already in the process of excavating two more fossils, including a second adult woman and a baby. And Berger has brought in what he calls "the best reconstructors in the world" to re-create what the boy's face would have looked like. "We'll be telling you a lot more about the species as time goes on," he says. The team has also found numerous bones of animals, including remnants of saber-toothed cats, that lived alongside the hominids. "The quality of site means I won't have to speculate much at all about the environment they inhabited or the animals they lived with," he says. Lastly, Berger suggests the tantalizing possibility of testing the fossils' DNA. Although the oldest DNA paleontologists have successfully recovered so far dates back only tens of thousands of years, Berger said at a press conference, "We have states of preservation here that are truly extraordinary." But is it even possible to retrieve 2 millionyear-old DNA? It's a long shot, he says, "but we're treating it as though maybe it could be preserved."